What would you do if you ran across a help wanted ad in the newspaper for a wife? Would you answer it? Laugh about it? Share it with a friend? The idea of running across such an ad is so far-fetched, but it leaves you wondering, what would make you answer such an ad? Darcy sees the ad while searching the classifieds: Wanted: Wife, $1000 weekly and all expenses paid. She’s currently on the verge of being evicted from her apartment. Things aren’t looking good. So why not inquire? See what the job entitles? Now a days, the average person would not answer such an ad. You’d have to wonder what the person writing the ad was thinking. Were they some sort of serial killer? How desperate would someone be to place an ad like that? 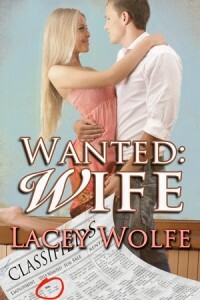 Wanted: Wife is meant to be a fun story about two people being reunited. In high school Darcy was the girl no one noticed and Steven was the star football player. Two different worlds, and yet they each secretly had a crush on one another. The story sizzles as these two try to keep things platonic, but is there ever really possible when two people want one another? So now, tell me. What would you do if you ran across an ad in the paper where someone was requesting a wife?